High Rise Developer Testimonial Houston Granite and Flooring L.L.C. High Rise Developer Testimonial - Houston Granite and Flooring L.L.C. I had a great experience and the whole process was complete within 2 weeks. 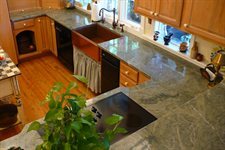 The Houston Granite and Flooring team was very accomodating and professional. The new counters look beautiful!